Although glucose ordinarily is the sole fuel of the brain, when the plasma concentration of the ketone bodies rises into the range of 2-4mM, these organic acids can satisfy as much as 70% of the metabolic requirements of the brain (26). Such intense ketone-mia occurs most commonly during starvation, when hepatic glycogen stores become depleted and the breakdown of triglycerides in adipose tissue favors the delivery of fatty acids to the liver. The liver first oxidizes these lipids to acetyl-coenzyme A (acetyl-CoA), and from this intermediate the liver synthesizes the major ketone bodies 3-hydroxybutyrate and acetoacetate. 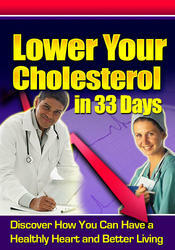 Liver does not utilize ketone bodies to satisfy its own metabolic needs. This requirement is met primarily by the large influx of fatty acids from adipose tissue. Instead, the liver releases the ketone bodies into the bloodstream, where they are taken up by a number of tissues, primarily skeletal muscle, kidney, and the brain. A series of monocarboxylate transporters mediates the uptake of ketone bodies into and through the central nervous system (27-30). The rate of uptake appears to follow closely the concentration of the ketone bodies in the blood. It is likely that intracerebral metabolism of the ketone bodies occurs in both neurons and glia, although the relative contributions of either cell type to this process are uncertain. Furthermore, the avidity with which individual cells utilize ketone bodies varies during brain development. The relatively immature brain, which must form copious amounts of myelin, appears to draw heavily on the ketone bodies as a source of the acetyl-CoA units that are the fundamental precursors to myelin lipid (31-33). Ketosis is favored in the suckling animal by the high fat content of maternal milk (34,35). Fig. 3. Metabolic pathways of ketone body degradation. The primary circulating compound is 3-hydroxybutyrate (3-OH-butyrate), which is converted to acetoacetate in a NAD-dependent reaction. Acetoacetyl-CoA then is formed in the succinyl-CoA transferase reaction. A specific thiolase then converts acetoacetyl-CoA to acetyl-CoA, and in this form the ketone bodies enter the tricarboxylic acid cycle. cycle. Acetoacetyl-CoA is cleaved via the action of a specific thiolase to yield acetyl-CoA, which enters the tricarboxylic acid cycle via the citrate synthetase reaction. The consumption of either glucose or ketone bodies provides the energy that is necessary to fuel brain function, most importantly the maintenance of the ionic gradients that are essential to all neurotransmission. In this sense, the choice of either glucose or ketone bodies as a metabolic substrate is essentially transparent to the brain. However, as shown in Fig. 4, it is evident that distinctive biochemical pathways mediate the consumption of these respective fuels. In the cytosol, the glycolytic pathway converts glucose to pyruvate, which is transported into mitochondria and further metabolized to acetyl-CoA via the pyruvate dehydrogenase reaction. The cytosolic glycolytic pathway also yields reduced NAD (NADH), which is indirectly transported into mitochondria via the malate-aspartate shuttle, as shown in Fig. 4. In mitochondria the NADH becomes oxidized in the electron transport chain, in the process yielding ATP. In contrast to the cellular metabolism of glucose, which yields NADH in both the cytoplasmic and mitochondrial compartments, the metabolism of ketone bodies occurs exclusively in the mitochondria, according to the sequence of reactions shown in Fig. 3. Thus, the metabolism of the ketone bodies occurs only through mitochondrial formation of acetyl-CoA, whereas the consumption of glucose includes a cytoplasmic component (glycolysis) that allows the derivation of energy without the necessity of funneling all glucose carbon through a pool of mitochondrial acetyl-CoA. Indeed, as noted earlier, in the nonketotic state glycolysis may be the predominant pathway of glucose metabolism in astrocytes, which may furnish lactate to neurons that use this intermediate as a fuel. In addition to enhanced internal production of acetyl-CoA, it also may be that in ketosis external acetate, which likely is present at a higher concentration in the blood of the ketotic individual, is readily consumed in the brain (Fig. 4). It is thought that the astrocytes are the favored site of cerebral acetate consumption (37,38), primarily because acetate uptake into glia is faster (39). An expected consequence would be greater acetyl-CoA levels as well as glutamine production in ketotic brain, conclusions we have recently confirmed (unpublished data). Fig. 5. Formation of [15N]aspartate from [15N]glutamate in cultured astrocytes. Cells were incubated in the presence of [15N]glutamate for the indicated times. 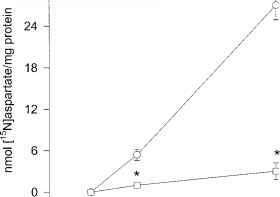 Gas chromatography-mass spectrometry was used to measure the appearance of label in [15N]aspartate: circles, control; squares, acetoacetate (5mM); *, p < 0.05 relative to control. Data from ref. 7.
equals the rate of synaptosomal respiration (42). Formation of citrate involves the condensation of acetyl-CoA with oxaloacetate, and, as flux through citrate synthetase becomes intensified, the concentration of oxaloacetate in brain is diminished. As already noted, transamination to aspartate is a major route of brain glutamate metabolism (6,7,23,43,44). Furthermore, flux through aspartate aminotransferase, an equilibrium enzyme, will be closely linked to the size of the oxaloacetate pool. The relative diminution of the latter in ketosis would be expected to lead to a reduced rate of transamination of glutamate to aspartate because oxaloacetate serves as the acceptor of the amino group of glutamate in this reaction (Fig. 1) (4,45). Fig. 4. 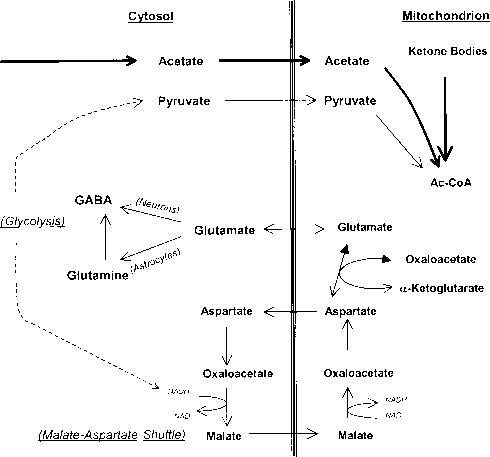 Schema of putative effects of brain ketone body metabolism on glutamate metabolism. As brain respires to a relatively greater extent on ketone bodies, it must form relatively more ATP from acetyl-CoA; this is because the diminution of glucose flux through brain lessens the importance of glycolysis as a source of energy. In addition, it is likely that during ketosis the brain utilizes external acetate as a major fuel. Increased combustion of acetyl-CoA implies greater flux through the citrate synthetase reaction and a corresponding reduction in the availability of oxaloacetate to the aspartate aminotransferase pathway. A consequence is less conversion of glutamate to aspartate and a more efficient conversion of glutamate to both glutamine and GABA. The anticonvulsant effect of the keto-genic diet may be a salutary effect of augmented GABA-ergic "tone" in the brain. [15N]aspartate. Gas chromatography—mass spectrometry was used to measure the 15N enrichment in amino acids. 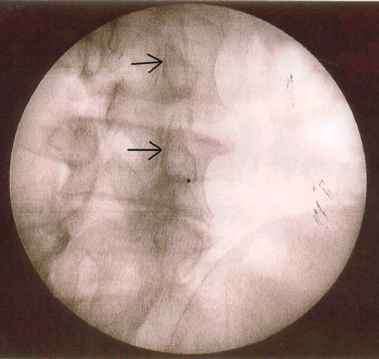 When the incubation medium also contained acetoacetate (5mM), there occurred a significant reduction in the rate of glutamate transamination to aspartate. At 5 min, the concentration of intra-astrocytic aspartate, in nanomoles of [15N]aspartate per milligram of protein, was (± SD) 5.4 ± 0.8 (control) and 1.0 ± 0.1 (acetoacetate) (p < 0.05). After 20 min the difference was 27 ± 2.1 (control) and 3 ± 1.2 (acetoacetate) (p < 0.05). Internal [15N]glutamate was similar in control and experimental incubations, indicating that ketone bodies affected glutamate transamination rather than uptake. A similar response to ketosis had been observed previously. Thus, reductions of brain aspartate concentration have been observed in suckling mice injected with ketone bodies (46) and in rats fed a high-fat diet (45). As less glutamate is transaminated to yield aspartate, more glutamate becomes available to the glutamate decarboxylase reaction (glutamate ^ GABA + CO2; Figs 1 and 4) to yield GABA, the primary inhibitory neurotransmitter and a probable anticonvulsant factor (47-55). The rate of brain GABA synthesis is not always considered to be sensitive to the ambient brain glutamate concentration, which is present at a level (8-10mM) that should saturate the glutamate decarboxylase pathway (Km 0.2-1.2mM). However, glutamate concentration in the brain is not uniform in all cell types, and levels in GABA-forming neurons are especially low (56,57). Furthermore, the pool of glutamate that serves as a precursor to GABA probably is less than 5% of total brain glutamate (58,59), even though GABA-ergic neurons constitute 20% of all neurons. In addition, it should be emphasized that the glutamate decarboxylase pathway is tightly controlled, with flux through it (approx 0.5 nmol/min/mg protein) (44,60) far less than overall enzymatic activity (60). Relatively slight changes of glutamate concentration in GABA-ergic neurons can alter flux through the pathway (61). Metabolic regulators of glutamate decarboxylase include Cl- and aspartate, which, by increasing the affinity of the enzyme for glutamate (62,63), may render GABA formation even more responsive to the ambient glutamate concentration. The experiments shown in Fig. 6 illustrate this process (43). When synaptosomes were incubated in the presence of acetoacetate (5mM), the internal glutamate concentration was consistently greater than control values and the internal aspartate concentration was significantly reduced (Fig. 6, left). A very rapid and significant increase of intrasynaptosomal GABA concentration was noted (Fig. 6, right). We documented that the increase of GABA concentration reflected increased synthesis by incubating the synaptosomes with either l-[2H5-2,3,3,4,4]glutamine or l-[15N]glutamine (0.5 mM each) and following the appearance of label in [2H4]GABA or [15N]GABA. This work confirmed that inclusion of acetoacetate in the incubation medium significantly enhances the rate of GABA synthesis from glutamine (43). Fig. 6. Metabolism of glutamate in synaptosomes in presence of acetoacetate. Synaptosomes incubated for the indicated times in the presence of glutamate with or without acetoacetate (5mM). Presence of acetoacetate inhibited the transamination of glutamate to aspartate, thereby increasing the internal concentration of glutamate, lowering that of aspartate, and increasing that of GABA. Data from ref. 43. (Yudkoff et al., unpublished data), we have found that the administration of acetate, which brain metabolizes primarily in astrocytes, is associated with an increased rate of synthesis of both glutamine and GABA.